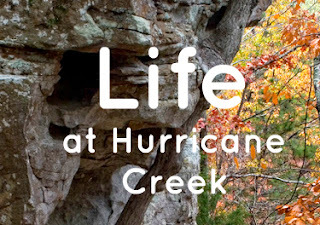 The life at Hurricane Creek does not exist independently of its surroundings. In fact, it exists as a result of its surroundings in intricate and complicated patterns. All ecosystems have characteristic feeding patterns, or trophic patterns, that organize the flow of energy into, through, and out of the ecosystem and support the growth of organisms within the system. Food webs are the trophic interactions of organisms within an ecosystem. In a watershed ecosystem, there are multiple interactions between aquatic and land-based organisms, leading to fascinating, complex food webs. Join us in learning more about the natural history and current life in the Hurricane Creek watershed. 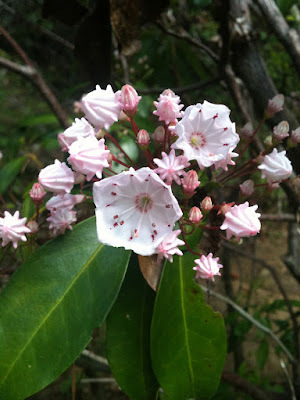 Mountain laurel creekside, March 2012. The Friends of Hurricane Creek is currently working on putting together a field guide for the creek ecosystem. If you are a professionally-trained scientist, an amateur scientist, an educator, or just an interested community member or young person who would like to assist us by visiting an area in the creek and filling out a field report, visit the Community-Created Field Guide page to get involved. Every single species we can document helps increase local knowledge about Hurricane Creek.